With the rising of the sun, we welcome a new day, new day which has many things in store for us- NEW HOPES, NEW PROMISES and NEW ACHIEVEMENTS. The wheel of time has yet again carried us to the last lap of our academic session. The old academic year is thus about to end to give way to a new, exciting and fun filled year. The academic session 2015-2016 was an eventful and a fruitful year. For this we thank you parents! Your constant co-operation and support has only made this possible. Assemblies are the cornerstone of our curriculum. Classes I and II regularly hold assemblies every Monday which are informative, interactive and fun loving. Literary Week was organized from 1st February 2016 to 5th February 2016. This provided a platform to our students to showcase their literary talent, be it their oratory skills or written skills. 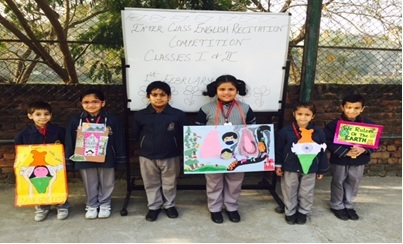 To begin with an Intra Class English Recitation Competition was held wherein the students participated with great enthusiasm. Through deeply inspiring poems students tried to inculcate values among their fellow friends – like honesty, courtesy, keeping our surroundings clean and pollution free and saving girl child. 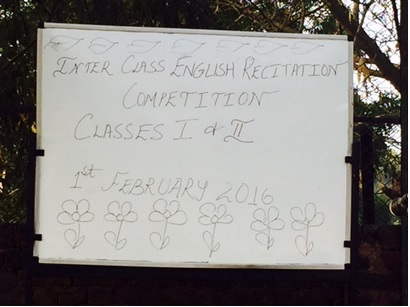 On 2nd February,2016 Intra Class English handwriting competition was organized. 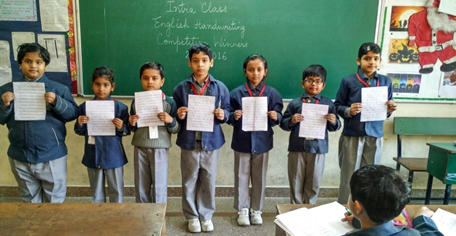 The children were encouraged to write neatly in a good handwriting to the best of their ability. 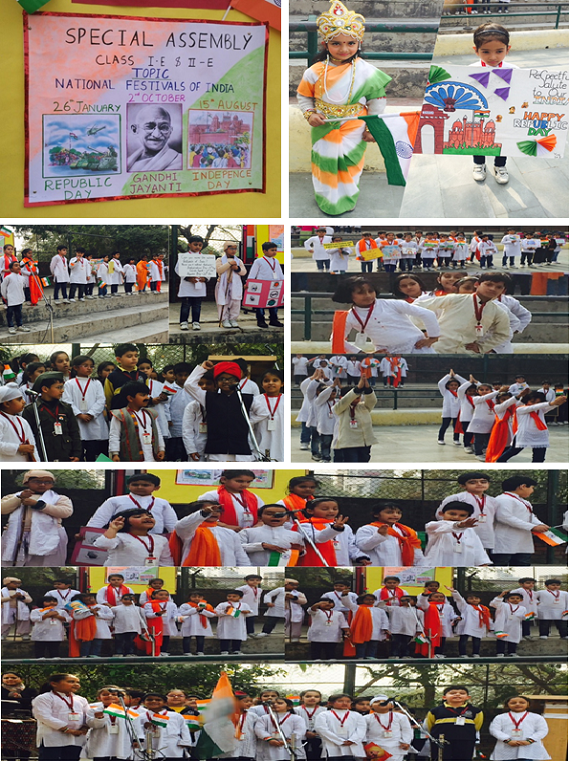 A special assembly on the topic “National Festivals of India” was presented by classes I E and II E on 29th January,2016. The students spoke about national festivals that bind us together in a thread of unity and brotherhood. There are three national festivals of India – Republic day – 26th January, Independence Day – 15th August and Gandhi Jayanti – 2nd October. They also spoke about the importance of each national festival and how they are celebrated. 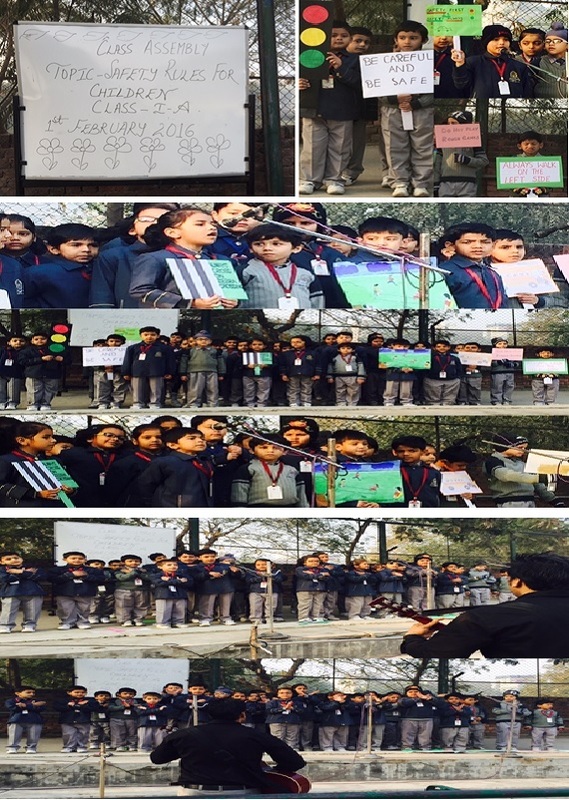 On 1st Feb,2016 students of class I A presented an assembly on the topic. “Safety Rules for Children”.Participants spoke about the safety rules to be followed at home, on the road and in school to avoid accidents. They emphasised on the need of following safety rules in school like always walking on the left side while using staircase and not running or pushing each other. For road safety, children were made aware about significance of traffic lights, zebra crossing and the various traffic symbols. 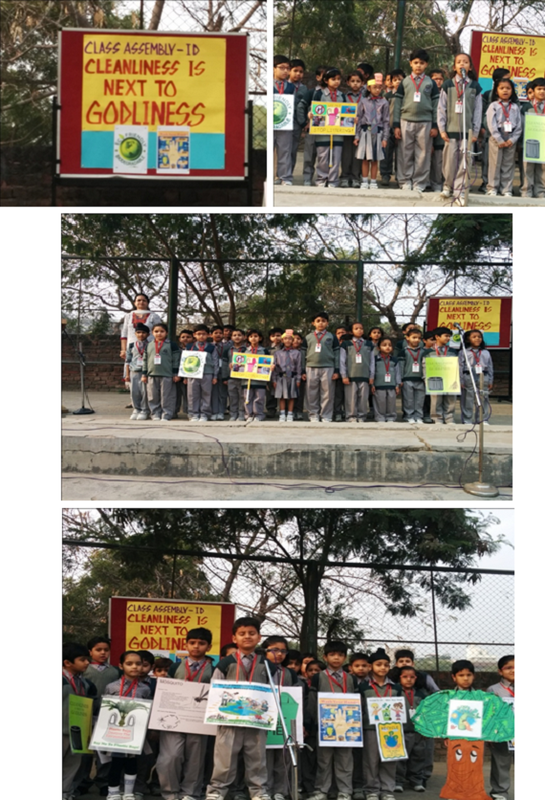 An assembly on the topic “Strange Animal Facts” was presented by class I B on 8th Feb,2016. Children shared a few amazing & interesting facts about animals. The assembly was interactive, where the participants posed questions to the audience and made them repeat the facts with them. 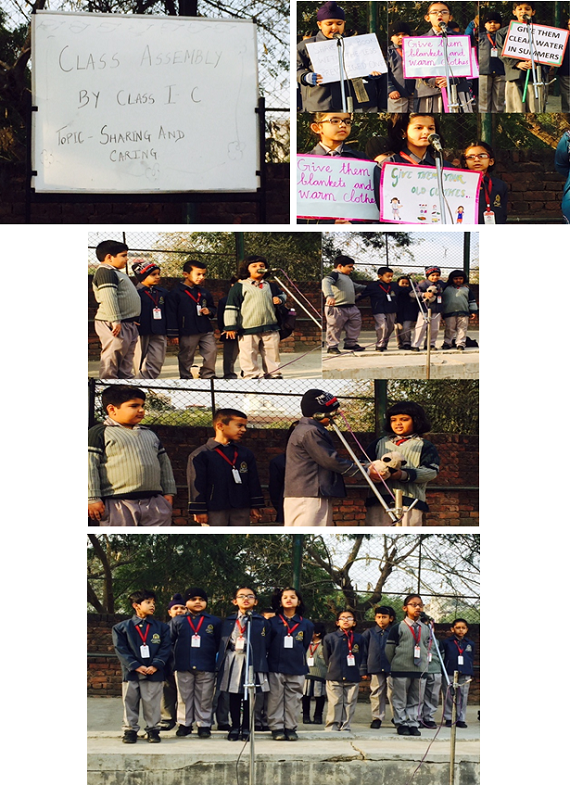 On 15th Feb,2016 class I C presented an assembly on “Sharing &Caring”. A story was narrated and enacted through which the importance of sharing was highlighted. The children recited a poem on sharing and caring and showed through placards how we can share things with the less privileged ones. 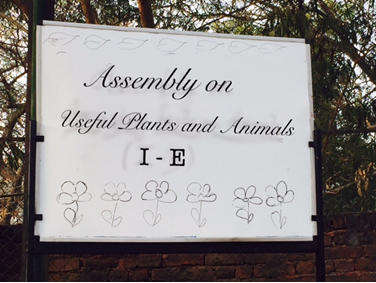 On 24th Feb,2016 class I E presented an assembly on “Useful Plants and Animals”. The students made the audience aware of the various useful things which we get from plants like jute, cotton, rubber, tea, coffee etc. They also recited a poem ‘How to make a garden’. 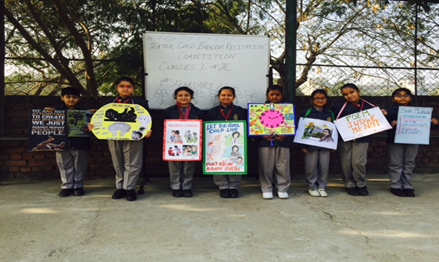 On 29th Feb,2016 class I D presented an assembly on “Cleanliness is Next to Godliness”. As the name suggests, the assembly conveyed that cleanliness is important to have a healthy body and a healthy mind. Congratulations to all the participants and to the teachers who guided them through these assemblies. 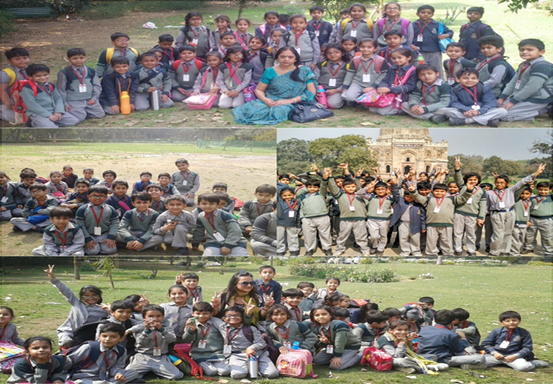 On 29th Feb,2016 a fun filled trip to Nehru Park and Lodhi Garden was organised for the students of class I and II respectively. 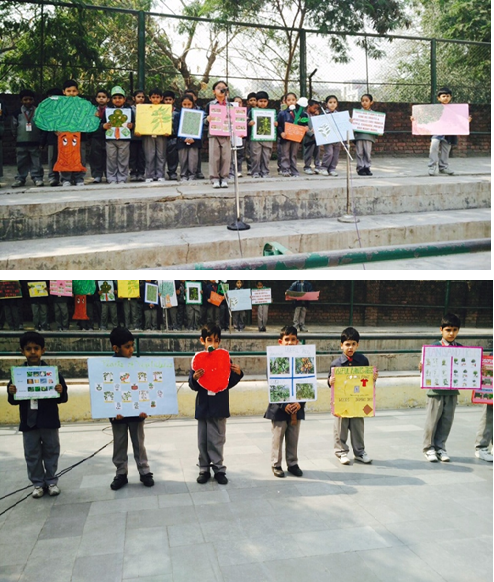 The children enjoyed a lot and also learnt about different types of plants as they were taken for a nature walk. The teachers have worked throughout the year with the little ones to make them thorough with their curriculum.To further prepare the students for the next class, a regular recap of all the topics will be carried out throughout the month of March. The last working day for the students of class I is 17th March,2016 and class II is 18th March,2016. New academic session will begin on 4thApril, 2016 and all the students are expected to come to school in their summer uniform. Wishing you all the best for the next session.